The bridge links Southease Parish which was divided by a ‘cut’ in the Ouse created in 1791 to improve the river’s flow. The bridge has two cast-iron spans, one of which rotated through 90 degrees to allow sea going barges access to Lewes from Newhaven. After Asham chalk pit closed in 1967 commercial river traffic ceased and with it the need for the bridge to open. Southease Bridge, which is in the South Downs National Park, continues in daily use as the crossing point over the River Ouse for the South Downs Way National Trail, and for farm vehicles and as a route to Southease Station. In 2008 the Environment agency had been planning to replace the bridge with a modern single span steel structure but Southease Parish, with the help of South Downs Joint Committee Planning Officer, Nat Belderson, and the Sussex Industrial Archaeological Society succeeded in getting English Heritage to give it Grade 2 Listing. After six months work funded by the Environment Agency a major refurbishment of the 19th century Bridge has been successfully completed. 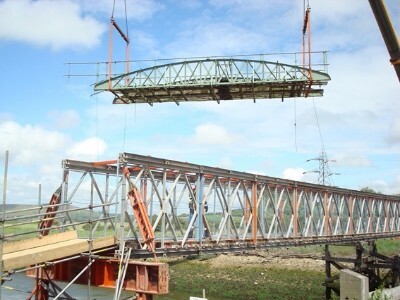 It involved a delicate engineering feat using a giant crane to lift the historic bridge off and swing in a temporary replacement, but for walkers only.